Just finished and uploaded a new design to the shop, and I’m pretty satisfied. Ereshkigal is a section out of the Scroll of Wisdom, the second goddess, after Athena, in the Alphabet of Desire. She’s a little bit creepy, but she’s an embodiment of death, so, what’s she supposed to do? I first met Ereshkigal in Alan Moore’s Promethea, where he retells the story of Ereshkigal having her younger sister, Ishtar/Inanna brought low. The goddess of the heavens is forced to give up all her clothes in order to descend into the land of the dead, in much the same way, I imagine, as a seeker of knowledge must shed certain thoughts and ideas that have adorned her in the past in order to unfold new mysteries. 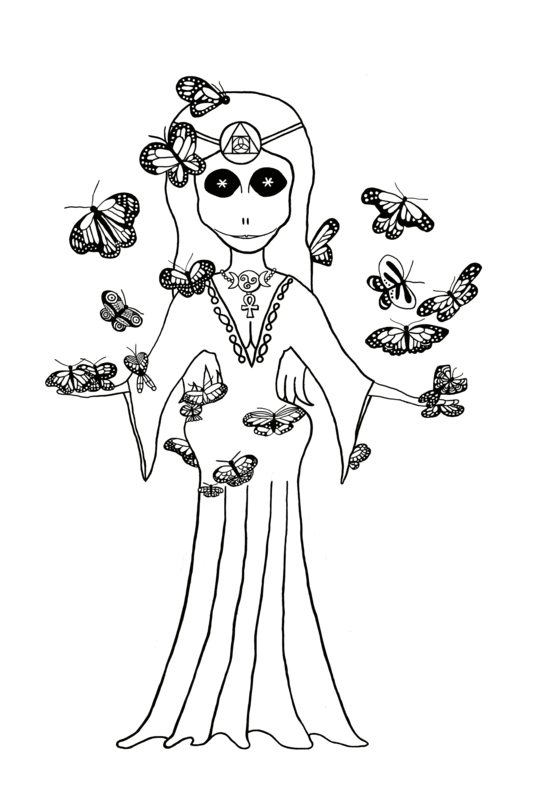 This entry was posted in Alphabet of Desire, Clothing and tagged alphabet of desire, art, butterflies, dead, death, drawing, goddess, T shirt, t-shirts on July 5, 2014 by littledragonblue. 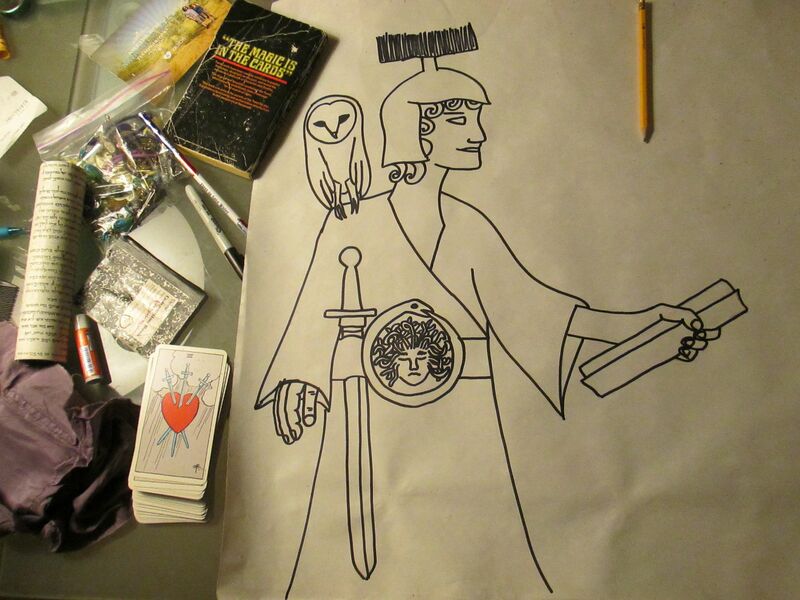 Athena, goddess of wisdom, offers the Scroll of Wisdom. She bears the head of Medusa, encircled by the ouroboros, on her girdle, and carries the sword of the Tarot, which is a symbolic tool for cutting through illusion to reveal truth. The idea of alphabets in general has always fascinated me, long before I ever even hear the term “font.” I read calligraphy books in grade school and often wrote out fancy alphabets as a centering technique. I liked the idea of decorative caps, and wanted to write an acrostic story with twenty-six chapters, which I would illuminate with twenty-six initial letters. Inking the illustration for chapter C: the magical rowan tree. Mandalas feature prominently in the scroll. 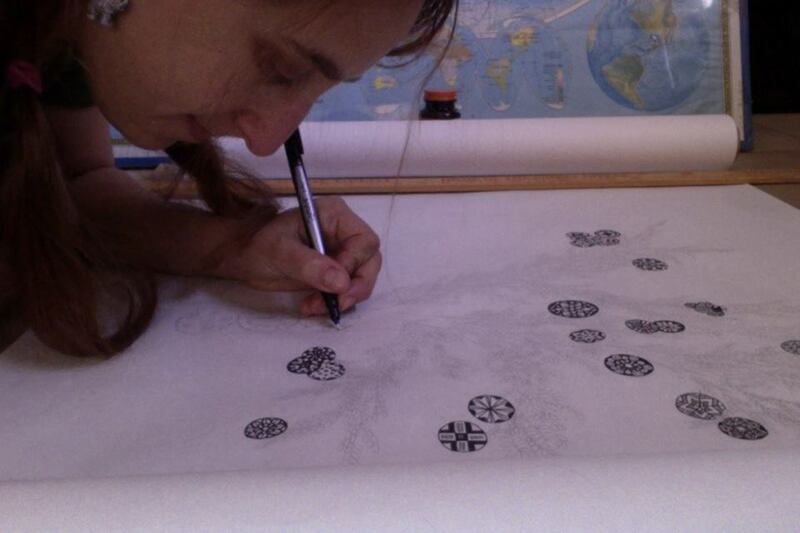 Illustrating the Scroll of Wisdom was a new challenge for me. Graphic storytelling had become fascinating to me in recent years, but my ability to draw in a regimented way, maintaining a consistent style and moving a character through a magical landscape, seemed overwhelming. However, the mission seemed clear. After spontaneously drawing Pallas Athene on a sheet of butcher paper, I realized that, rather then cutting her free from the roll, I should utilize this old method creating a text and simply let one drawing follow the next on a continuous sheet of paper. The story gradually revealed itself: a journey from initiation to mastery. The magician’s journey. The journey of the will. We’ll get back to this in a little while…. 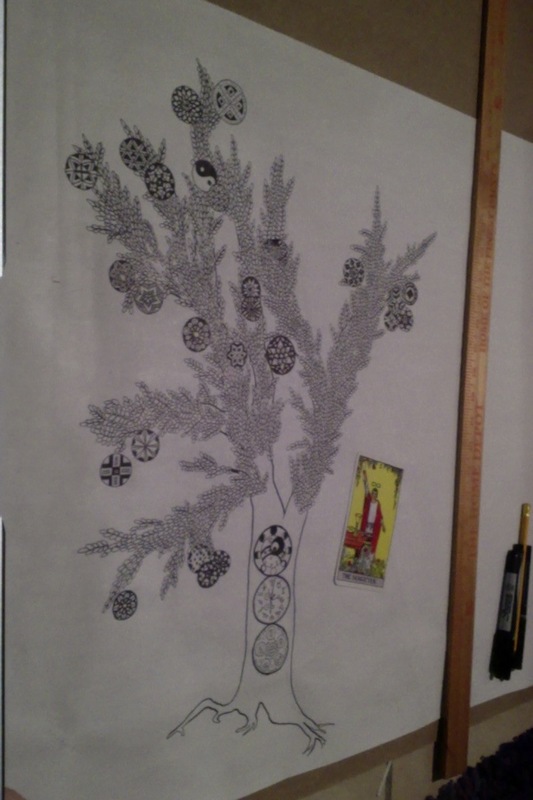 This entry was posted in Alphabet of Desire and tagged alphabet of desire, art, athena, goddess, magic, rowan tree, scroll, scroll of wisdom, tree on March 28, 2014 by littledragonblue.